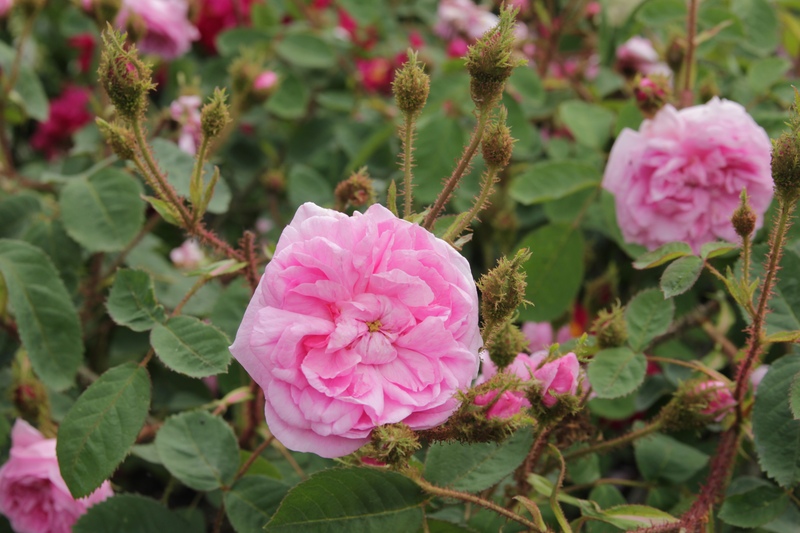 Moss roses are a distinctive group of roses, their flowers fill the air with fragrance whilst the soft sticky growth that covers their buds, act as sellotape on anything that passes by. The moss roses are indeed part of the larger centifolia group of roses but these roses at sometime, produced sticky soft growth to ward off sap sucking insects like aphids. The rose breeders during the 1800’s leaped apon this natural deviation and bred even more roses that were covered in this sticky soft mossy type growth. Some as a result were slightly less sticky than others! This mossy growth is basically formed from the glandular projections that cover the Rose stems and buds, this is what gives the roses the scent. In moss roses this somehow took a slight turn and became this soft sticky fragrant growth, which to many smells of spicy apples. Shailers white Mose rose is a sport off the common moss and can indeed at times revert back to the pink form just as the pink form can at times throw up this white form, again highly scented and once flowering. Though to of been around since 1790.